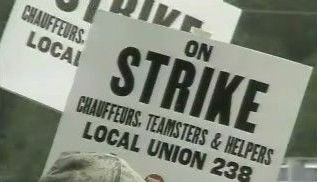 They are upset about non union carriers coming in to pick up their slack, what about the union carriers like Jack Cooper that the day PTS went on strike they gave Ford Motor Company 179 trucks? Looks like they need to be upset with their own more then the non union carriers. Also the teamster care nothing more about themselves, what about the car dealers that are waiting for their cars? PTS locked up their trucks loaded with vehicles and now no carrier can get them to their respectful home. So our question is, why is it the car manufacuters fault? Also the teamsters act like we are in Iraq, we are in America where it is a free enterprise. Non union carriers are doing nothing more then what was asked to do by the Big 3. My opinion is that the Union works real hard to protect their blue collar membership. A negative side effect of this is that they work against the middle class by trying to preserve union jobs and keep the union strong. I think we are seeing that the big corporations are taking over everything and when they do, they can set prices, wages etc. When that happens we need to band together and demand fair wages and prices. I would like it better If we could do it in a way that would allow a union driver to go into business for himself without being cut down by his own union. Right now the union will push out a guy that has managed to buy 4 or 5 trucks by trying to prohibit him from hauling for any of the big three. I’m not Anti-teamster but I’m not Pro-teamster either. I am pro free enterprise. Sometimes the unions help by keeping the big corporations in check and other times they hurt by suppressing the middle class operator. This entry was posted in Auto Transport and tagged teamsters, union. Bookmark the permalink. One Response to Did the Teamsters make the Right choice? yes they did, mainly because of paycuts while management didn’t, payup or close the doors.